This Domaine is one single property located on the steep slopes overlooking the village of Sarras. 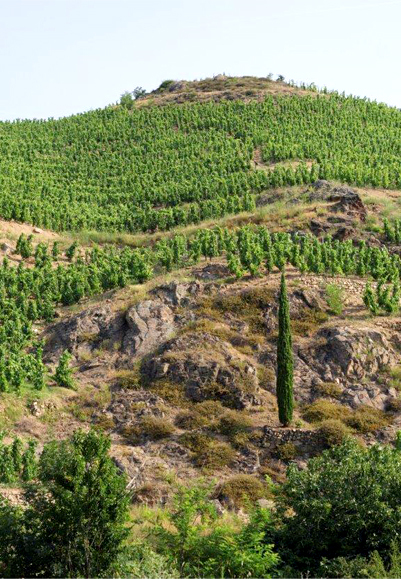 With an area of 5 ha, facing south-east towards the Rhône, this Domaine with granitic soils produces a rare wine with an assertive personality. Complete de-stemming before vatting. No yeasting. Fermentation at 30°C in temperature-controlled stainless vats. Final hot maceration. Devatting around 4 weeks after vatting. Maturing 12 months on wood in demi-muid barrels and oak casks. Colour : Deep red, clear and gleaming, glints of purple, very dense. Nose : Complex and powerful, combining aromas of leather, violets, and liquorice. Palate : The full-bodied tannins are accompanied by woodiness, the chocolaty flavours are long and persistent. Plenty of body and vigour in this wine with very good keeping potential. To be enjoyed at near room-temperature (14° et 16°C) with sauced meat dishes and small game.